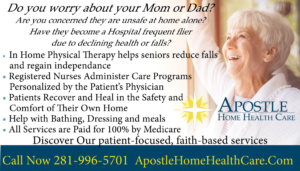 Are your senior loved ones safe with their paid caregiver? Learn how to make sure! Without the video surveillance equipment, the family would never have known what was happening to their mother! Join us live on The Senior Answer, at 11 on Saturday morning on 100.7 FM KKHT as we learn about protecting our seniors with in home audio and video monitoring systems to with our expert guests Danny Myers and David Dusl with Lighthouse Video Surveillance of Houston. No radio? Listen on line at www.senioranswer.org! •	Why install video and audio recording equipment in a loved one’s home? •	Are there legal limits on who or what I can record? •	Are there different rules for video and audio? •	Covert or overt equipment? •	What are the laws in Texas regarding selling, designing and installing camera systems? •	Is this something that can be a DIY project? •	Can I watch the system from a remote location? Can the systems alert me to unusual events? •	Should I also watch the home exterior or entryways for intruders? •	Do I need an infrared security camera? •	How often should I check to see what is recorded? •	Do I need battery backup for my camera system? •	Can outdoor cameras be used indoors or vice versa? •	How to find an installation company that is right for me?